The beautiful orange flowers on the trees by the campground. 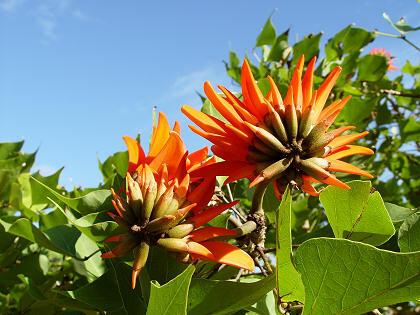 I believe these are a type of Coral Tree, Erythrina sp. 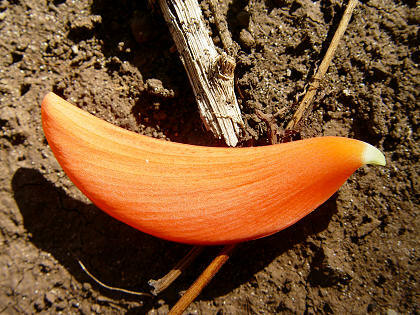 A close-up of a single flower that fell to the ground. After enjoying a good long visit we decided to return to the boat and walked back towards the landing. On the hill above the landing we saw a picnic area and campground and walked over to take a look. 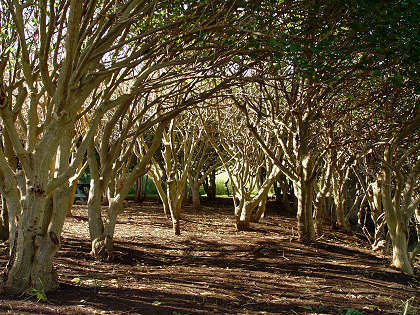 The campsites were set amidst a dense grove of small flowering trees, trees that had clusters of beautiful elongated orange flowers. The whole visual effect was quite lovely—green woods with orange-flowering trees overlooking blue water and white sand. Both the picnic area and campground were unoccupied. Nearby on the hillside we saw another restored shrine called Ahu Vaka Tu Puna Maori. 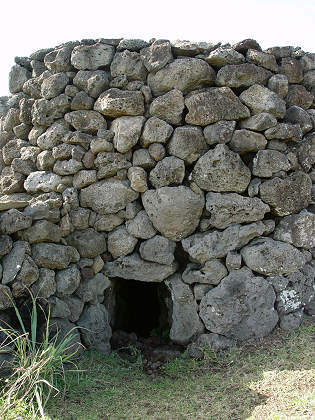 This ahu was built of carefully-fitted basaltic rocks and was quite tall, but it didn't have a moai on top. Instead, at the base of the ahu there was a small opening and narrow passageway framed out in rocks that went deep into the dark interior of the ahu. Needless to say, I didn't go in—it was way too spooky (plus you're not supposed to enter or climb on any of the ahu). After we got back to the boat Marcie and I both spent some time looking at our pictures on Marcie's computer. The smell of smoke intruded and I went topsides to discover that someone had built a big smoky fire ashore. It had dark orange flames and thick rolling black smoke, like they were burning tires or something. Unfortunately for us, we were directly downwind from the fire and had to endure the stinky smell. Worse than that, the smoke deposited numerous small particles of soot on the boat. When you tried to wipe them up, they smudged into black streaks that took extra effort to remove. After a while the fire died down and finally went out. In the morning before we went ashore I had done some laundry but left it soaking in the bucket. Once we got back (and after the fire went out) I strung up a clothesline and hung up my laundry to dry. It had been a pretty nice morning and early afternoon, mostly sunny and breezy, but by midafternoon it started raining off and on and I had to take my laundry down before it was dry. Luckily, the rain washed most of the soot off the boat. We had been hoping to go ashore again in the afternoon, but the rain put an end to our plans. Since it was the weekend, there had been a few dozen people enjoying the beach, but the rain put an end to their plans, too. Looking around the shoreline, I saw some people huddled next to some big rocks along the shore. Apparently, they had been out on horseback and had been caught in the rain. They didn't have any rain gear so were no doubt very uncomfortable—cold and wet. Later, we saw that they had built a fire, but the fire was too small to be of any great benefit. 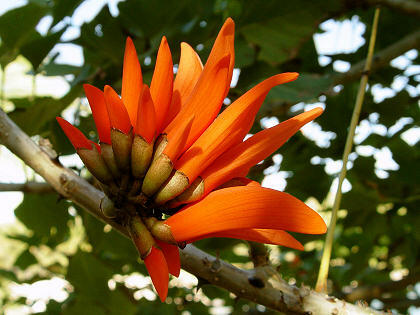 These are the trees that have the orange flowers. This is also the campground. Although it was unoccupied, you were supposed to pitch a tent in the clear space between trees. Ahu Vaka Tu Puna Maori, with the dark creepy tunnel leading into the interior.